Smart Design: Our convertible Velocé (veh-LOW-chay) Shoulder Bag can be 1. slung over your shoulder, 2. worn like a backpack, or 3. carried by its hand grip. It's also a perfect year-round bag for commuting to work or school. 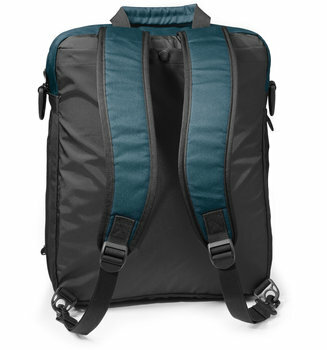 Over Your Shoulder: The adjustable curved-and-padded shoulder strap is strong and comfy. On Your Back: The two curved-and-padded backpack straps are easy on your shoulders, and tuck away, out of sight until you need them. 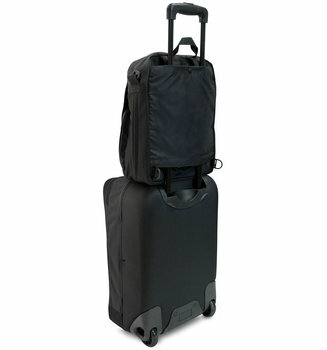 All the Right Places: The roomy main compartment includes a full-width back pocket that’s large enough for a laptop. Outside (and hidden!) 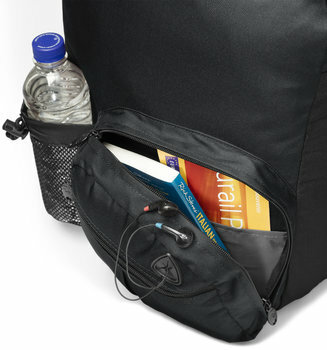 you’ll find five zippered pockets for all your travel odds and ends, and a mesh water bottle holder. The sleek, reverse-style zippers (better for keeping moisture out) feature heavy-duty pulls. It Expands: Zip open the handy expando-zipper, and the main compartment's capacity grows by 20% to more than 1,000 cubic inches. Roll with It: The back panel slides and snaps securely over any rolling bag handle, so you can stack 'em and roll 'em together! Family Ties: Our smaller, matching Velocé Guide Bag for iPad is an ideal book/tablet/camera bag companion.